"Then another servant came in. The servant said to the king, 'Sir, here is your bag of money. I wrapped it in a piece of cloth and hid it. I was afraid of you because you are a hard man. You even take money that you didn't earn and gather food that you didn't grow!' Then the king said to the servant, 'You bad servant! I will use your own words to condemn you. You said that I am a hard man. You said that I even take money that I didn't earn and gather food that I didn't grow. If that is true, you should have put my money in the bank. Then, when I came back, my money would have earned some interest.' Then the king said to the men that were watching, 'Take the bag of money away from this servant and give it to the servant that earned ten bags of money.' The men said to the king, 'But sir, that servant already has ten bags of money!' The king said, 'The person that uses what he has will get more. But the person that does not use what he has will have everything taken away from him. Now where are my enemies? Where are the people that did not want me to be king? Bring my enemies here and kill them. I will watch them die!'" If the others who received the King's bags of money made good use of them, the third servant mentioned did just the opposite. His view of the King was very negative and he was afraid to take risks and truly use the money entrusted to him. His fears made him take the greatest risk of all: doing nothing. Fear immobilizes us. 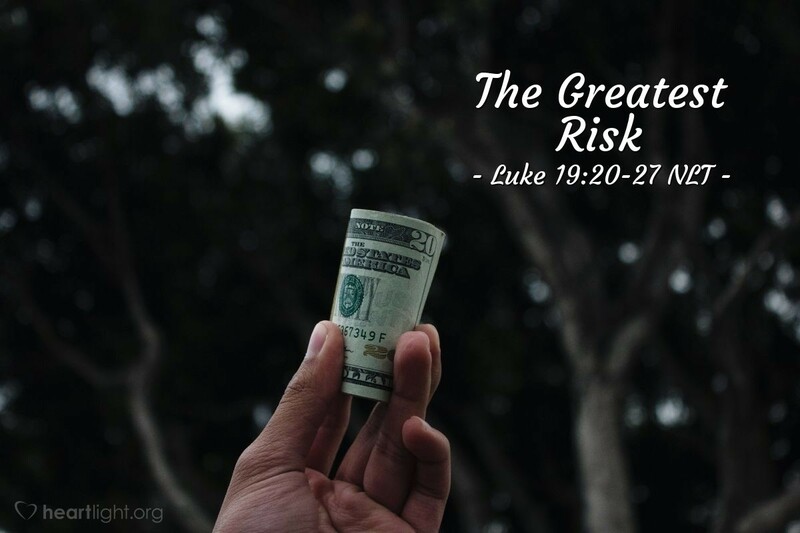 Jesus doesn't want us to be afraid to risk for the Kingdom; in fact, he wants us to know that the greatest risk of all is to look fearfully at God and to think we are playing it safe by just hiding all that he has entrusted to us to use for his glory. Father, keep my heart from being afraid to make great efforts to do great things. While I know that there is always a chance of an embarrassing failure, I also realize that an even greater embarrassment would be to do nothing with all that you have entrusted to me. Give me wisdom and confidence in putting to use your truth and blessings in my life. In Jesus' name. Amen.